Two years ago, in idyllic Carystown, Kentucky, nine-year-old Isabella Moon disappeared on her way home from school. Is it just coincidence that Kate Russell, a young woman with no discernible past, arrived in town just months before Isabella's disappearance? When Kate walks into Sheriff Bill Delaney's office to tell him that Isabella's ghost has led her to the child's hidden grave, he immediately views her as a suspect. Mystery follows mystery as a local athlete drops dead, inexplicably, on the basketball court, and someone close to Kate is viciously murdered. Quiet Carystown was to be Kate's salvation, and she's settled into a comfortable job, a charming cottage, and a blissful romance. But having lied to her boyfriend, Caleb, for so long about the terrors of her past life, she finds she can't trust him to understand the terror that Isabella Moon has now brought. And Kate's best friend, Francie, is too wrapped up in her own troubles - particularly a secret affair with a man she at once loves and despises - to give Kate the help she needs. Utterly alone, Kate is torn between finding justice for the dead child and keeping away old ghosts of her own. The unsolved disappearance of Isabella Moon has been the biggest disappointment of Sheriff Delaney's career. But he senses that Kate is trouble. As he investigates her impossible claims, he also uncovers a series of unsettling truths about Carystown itself. Behind his hometown's genteel faÃ§ade is a morass of lies and murder, drugs and destruction. And Carystown's residents are about to discover that even though the past is buried, it can rise again - with a vengeance. 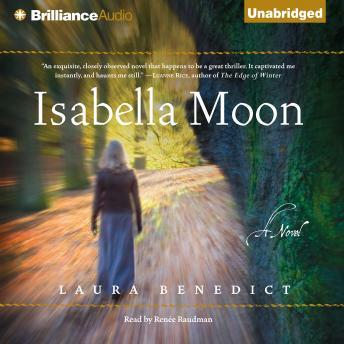 Dark and suspenseful, tense and eerie, tinged with the supernatural, Isabella Moon is an engrossing, beautifully written debut novel, a breathtaking and artful story of the dark mysteries that can lurk in the most bucolic of places - and the ghost of a little girl who watches as evil rises unstoppably to the surface.